HARD LIMITS? THERE AREN’T MANY. Keep reading for a steamy excerpt from The Escape by Teresa Crumpton!! Eyeing Rex I take a sip, letting the bubbles add to the allure of the atmosphere. Neither of us say a word until the bottle of sparkling wine arrives and Rex closes the red curtains surrounding our table. It gives this the illusion of privacy, and for the most part it does cut off people from trying to eavesdrop on our conversation. Besides, the patrons want a show and tonight they won’t be getting one from us. “Limits, likes, dislikes and most importantly desires,” Rex says, turning his focus on me. His body is buzzing with the need to touch as we have this discussion, but he holds himself back, just barely, as his leg rubs up against mine and his arm rests atop the back of the booth. I shift in the booth so my body is turned toward him, giving my full attention. Taking another sip, I spill, “I only have four hard limits. Everything else is free reign.” I watch his eyes darken with interest. “What are those four hard limits?” he asks. DO YOU KNOW ONE OF THE BOYS? 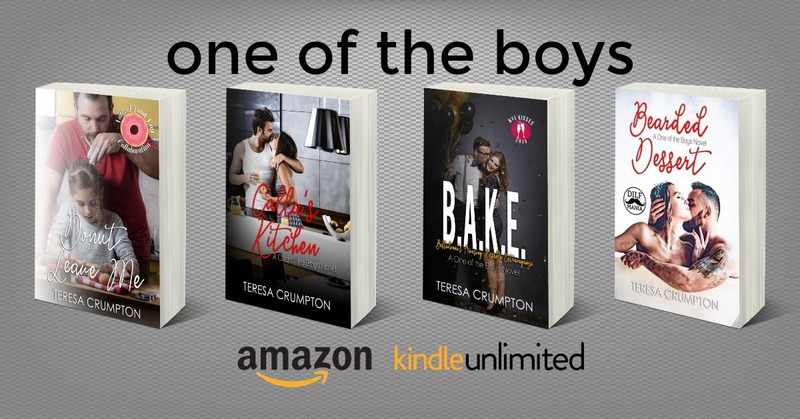 THEY’RE ALL FREE IN #KU!